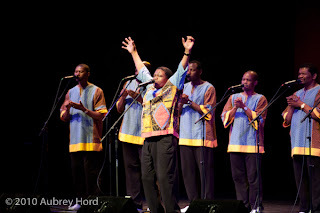 One of my favorite World Music groups performed on Maui last week at the Maui Arts and Cultural Center to a nearly full house. 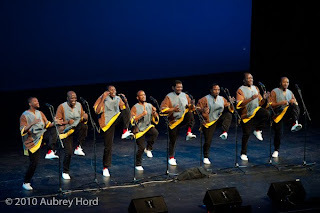 Ladysmith Black Mambazo showed off their high steps (complete with red socks!) to the sounds of smooth voices from South Africa. Ladysmith beacame even more famous with the partnership with Paul Simon on his Graceland album a few years ago. The group was founded over 40 years ago in South Africa and has performed all over the world This was their third performance on Maui at the Maui Arts and Cultural Center. And now to Elton John next month!